OK, so that is what Drake’s Passage is like. Last entry I was remarking how it had all been quite calm with only the odd bumpy part. Well, last night was a bit more what I expected. Not crazy, but enough to make a few more people on the boat (including Kate) feel a little queesy. The best part was during breakfast when the captain let us know we were in for a more sever bumpy patch. He wasn’t wrong. For about 30 seconds, things were quite hilarious/chaotic in the dining room, with food going every which way. Not quite everything everywhere… most things stayed on plates, but indeed there was quite a bit of food and drink spillage, including things off counters and tables. Good times! My stomach held fast though and still without the aid of medication. high five me! I am sure the passage will have something to say on the way home. Today was another predominant sea day, with expected arrival to Antarctica formally scheduled top happen late afternoon. So the plan for the day was more formalities, more lectures, and more kayak preparation. 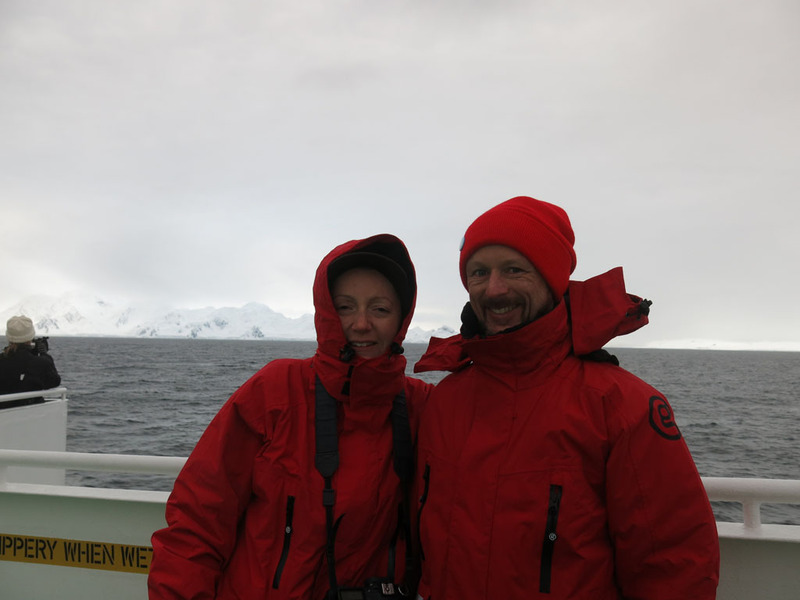 We started with the formalities… protecting Antarctica from any possible nasties we had with us. So everything that was going on to the ice and outer layers of clothes had to be checked out. Checked out meant disinfectant for shoes, walking poles, etc, vacuuming of the insides of backpacks, and inspection of garments. Kate and I didn’t have too much, as new things didn’t need to go through the rigamarole, so our new parkas and fairly new waterproof pants were a-ok. Only backpacks and camera gear really needed the eye. And all was good! We then proceeded to sign that we were going to respect everything and not jeopardise the Antarctic continent. Kate was a bit under the weather, so I went along solo to the lecture on seals. Actually, many of them are pretty ugly when you get down to it. Awesome, but when you see the pics of the Elephant Seals, they are not the most attractive thing you have ever seen. But the smaller Weddell Seals, along with the vicious Leopards, both of which we should hopefully see, looked cool, ramping up the excitement of the group. We even saw some graphic pics of leopard seals eating penguins. Hhhmmm… maybe I won’t film that if I see it. I also decided to explore the ship a little more. One thing we were able to do that many other ships don’t allow is to visit the bridge. The crew were very casual and nonchalant with visitors and let us wander around. We were even encouraged to get some photos taken… not that I needed much encouragement. Lunch was upon us, but after than Kate and I were straight back to the mud room for more kayak briefings. This time we were assigned our own kayak (named Minke), and had it all fitted out for us. There was also a bit of a run through of best practice, but it seemed more geared toward the real novices, which scarily there seemed to be a few. Kate and I got increasingly confident as we went on. When we were done there, Kate and I raced to catch the lecture on the penguins we were likely to see. It was super exciting to find out we were likely to see maybe half a dozen different types. Nope, no Emperor Penguins (they are further south), but lots of others. We were expecting to visit a few penguin colonies which had Kate all giddy with excitement. We were originally scheduled to arrive to Antarctica by about 3:30pm, but it seemed the bad weather we had encountered must have slowed us down, as it was not until about dinner time that we saw land. In fact it was during dinner that the official announcement was made that we were in Antarctica! Woooooo! But back to this in a little bit. 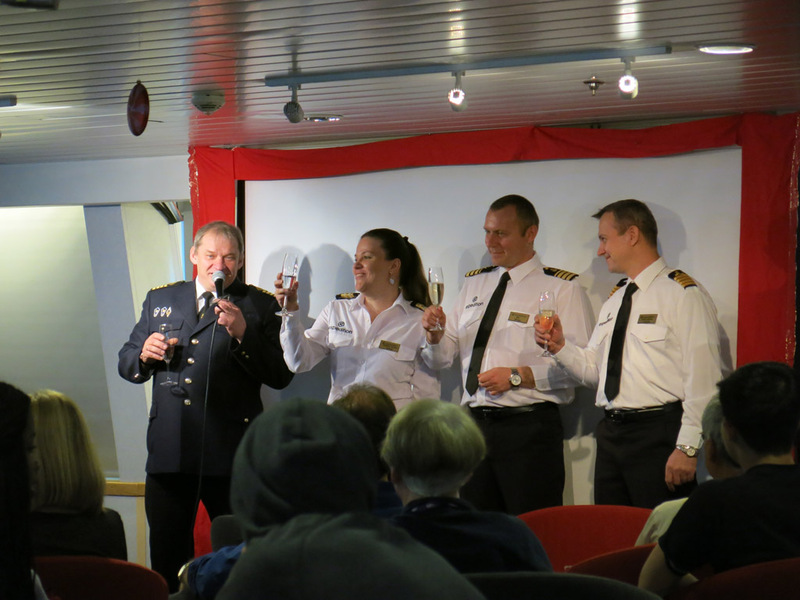 Before dinner we had the official Captain’s Greeting and celebration, where our Russian skipper introduced himself and main crew. He does not mix at all with the passengers which I guess is fair, as it is the G Adventures crews job to do that. But we all had a champagne toast to the trip and then off to our celebration dinner. It was just a little into dinner that the cries of “land!” were heard as we could start to see some land through the dense mist we found ourselves in. I couldn’t wait to get out there, but after dinner was yet another briefing (there is A LOT to cover! ), but they are all exciting, as this was for our camping expedition. Yep, Kate and I (and about 60 others) would be camping on the ice one night, at an as yet undetermined time. But as they aim to do it as soon as they can, there is a chance it will be tomorrow night (Christmas Eve!!!) so they filled us in on everything. Basically we tent and sleeping bag it out there, with nothing but our warm clothes and each others company and the potential of wandering penguins and seals. How can you not opt in for that?! It all sounded straight forward, so from now it was just the waiting game. 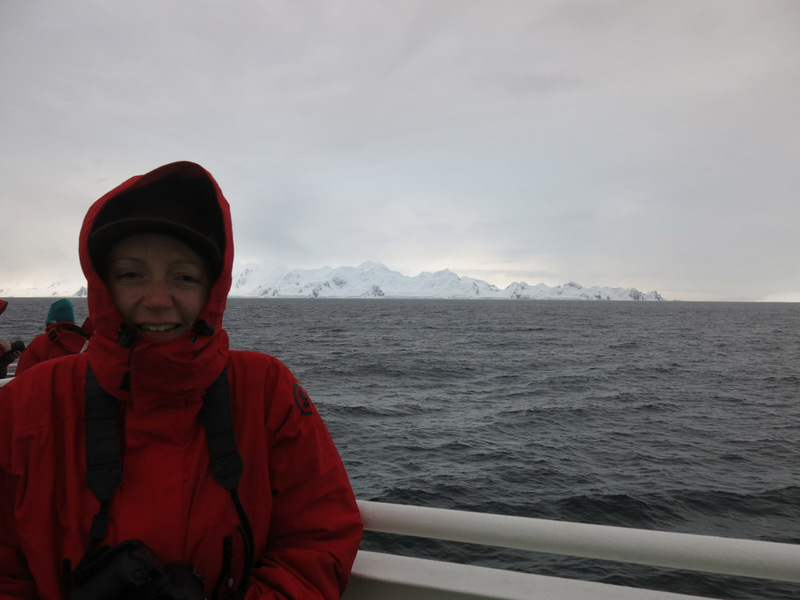 NOW it was time to get out on deck and soak up our formal introduction to Antarctica. It was awesome, as just as we went out the mist was lifting and the views of the nearby snow and ice covered mountains was becoming crystal clear. It is a bit cloudy, but views were getting better. We thought they were spectacular now, but we knew we hadn’t seen anything yet. But that wasn’t the most exciting part. For the (sadly) only about 15 of us out on the back deck of the boat we were treated to the first official whale sighting of the trip. Not one, but three whales made their way past our boat. 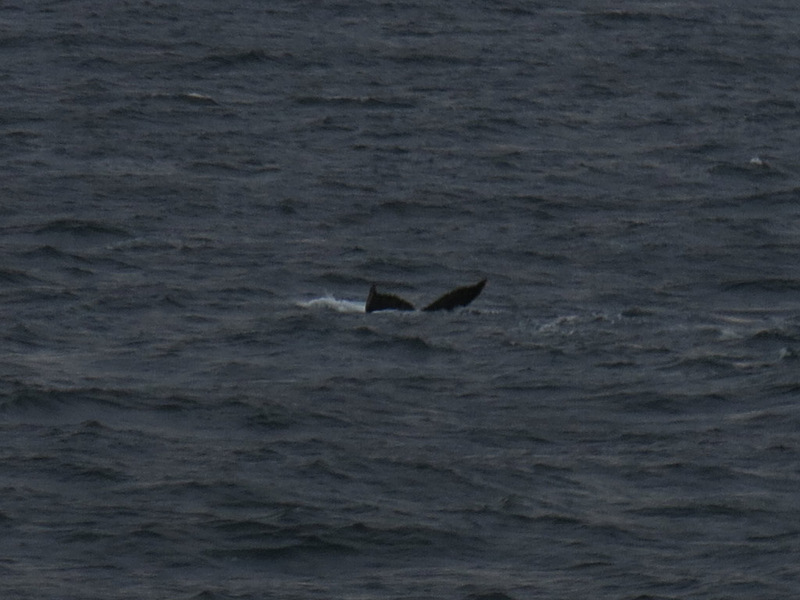 A bit of a distance, but close enough to easily see the spouts and their backs and tails come above water. We all got chills with the constant screams of “there they are!”. The excitement was so infectious. An announcement came over the PA letting people know but it was strange that in the end only about 30 of the 120 on board came out. They were obviously comfy inside and not too worried. Me I was buzzing. 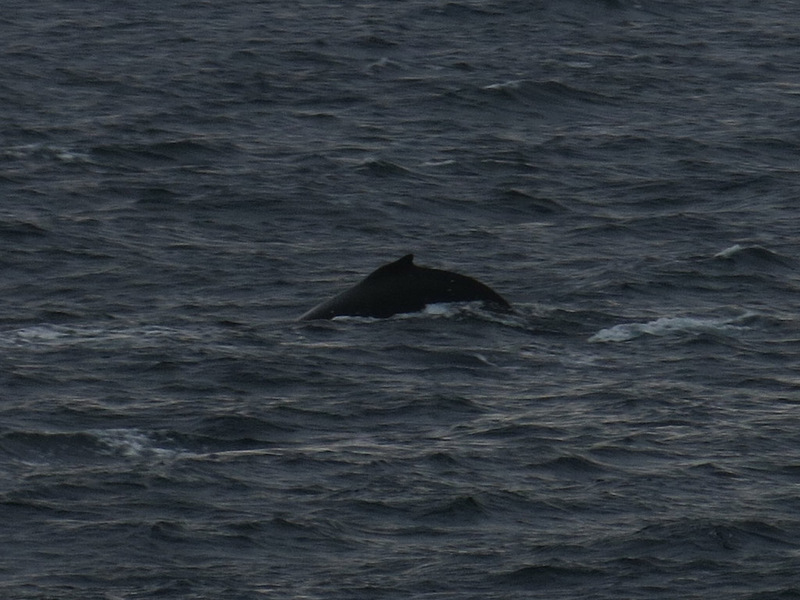 Over the next hour I saw about 9 different whales, apparently humpbacks and minkes. It was hard to get photos with my small camera, so instead I snapped a few but really just soaked it all up. I was in Antarctica alright.